Located in Tbilisi’s Vera neighborhood, a hip and evolving area that has historically been home to the city’s preeminent creatives and intellectuals, Stamba is well placed for proximity to the capital’s most exciting boutiques, bars, and restaurants. Just yards from the city’s famed Rustaveli Avenue, where some of Georgia’s biggest landmarks can be found, including the Opera & Ballet Theater and the Parliament of Georgia, this prominent position places Stamba side-by-side with its smaller sister property—Rooms Hotel—also overseen by the Tbilisi-based Adjara Group, which brought together local talent to create everything from Stamba’s uniforms to interiors, which were conceived by Adjara Arch Group. Defining this historic plot—once the site of the city’s very first cognac distillery—is the skeleton of a Brutalist former publishing house, now polished and primed host this indulgent and sensorial hotel. Built in the 1930s, the towering five-story edifice is laden with nostalgic references to the industrial era and frequent nods to the building’s previous incarnations, while cutting edge design and contemporary finishes bring this celebrated monument firmly into the present. Here, history overlaps with Tbilisi’s new chapter. 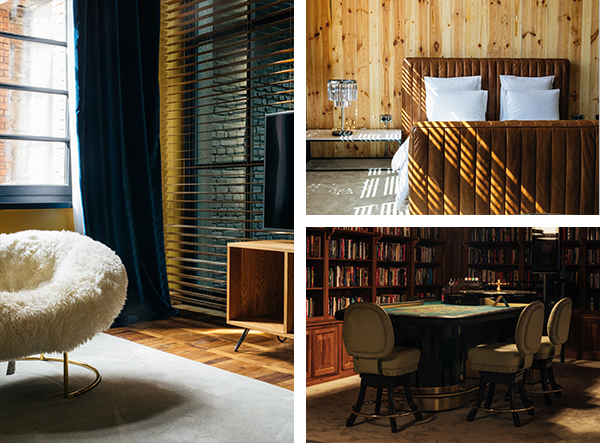 Led by the well-preserved architecture of the Brutalist structure, rooms are appropriately defined by high ceilings and exposed brickwork, with each 52 sqm space flooded with light via a series of oversized windows styled as exact replicas of those which once featured on the façade of the publishing house. Softening this aesthetic and completing the resulting industrial-luxe décor are a series of sumptuous touches, such as plush, deep pile carpets, butter soft leather bedheads, mirrored tables, and armchairs upholstered in natural wool. Gilded free-standing brass bathtubs sit in the center of guestrooms and offer extravagant vantage points from which to literally soak up the atmosphere, while in Stamba’s Corner Suites, sliding doors and well-defined spaces offer the impression of an upscale apartment. Beyond its accommodations, this labyrinthine property offers a plethora of public spaces to explore. A striking atrium that extends the full height of the building is topped by a glass-bottomed rooftop pool and flanked by a series of internal balconies, each offering supreme views of the former publishing house’s print drying beam, which now cuts through the hotel’s upper levels and is used to support the trees and foliage which weave and wind through the space. At the atrium’s base lies a discreet lobby and reception area, both lined with floor-to-ceiling bookshelves filled with a selection of the hotel’s huge collection of tomes that cover everything from literature to photography. 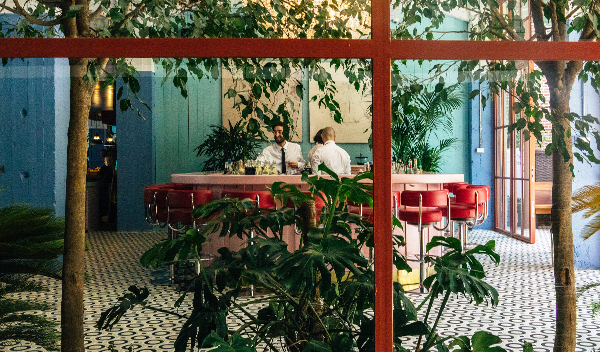 A grand double-height café, also filled with lush topiary, is where Stamba’s industrial chic aesthetic shines brightest. Exposed columns, partially covered in vintage mosaic tiles, buttress salvaged booths that have been given new life with mint green leather upholstery, while recovered pendant lamps and art deco chandeliers shine a well-deserved light on intricately patterned tiled flooring. A menu of modern comfort food makes an easy segue between Georgian and international cuisines and serves as a perfect prelude to the expertly crafted cocktails on offer at the adjacent bar, suitably crowned by a stunning crystal chandelier, and bounded by an outdoor terrace. Alternatively, nightcaps may be enjoyed in the subterranean steel-paneled casino bar, one part of the two-floor Aviator Casino which encompasses glamourous 1920s and 30s-inspired interiors that nod to aviation themes of that era amidst blackjack, roulette, and poker tables. It’s all rounded off by a connecting annexe which, come autumn, will host an exhibition space that incorporates the new Tbilisi Photo and Multimedia Museum and a number of art studios, as well as a co-working space and room for a program of events, which will undoubtedly spill out onto the hotel’s spectacular courtyard and outdoor amphitheater. This hotbed of talent and culture will no doubt cement Stamba’s entrenchment in its local creative community and compound its position as Tbilisi’s new visionary nerve center. Adjara Group is a leading regional company in the areas of hospitality, lifestyle development and agropreneurship. It has gained worldwide recognition for trend-setting establishments and exciting entrepreneurial projects through developing and managing lifestyle brands including the stylish and distinctive Rooms Hotels in Tbilisi and Kazbegi, the luxurious Stamba hotel and the vibrant and dynamic Fabrika Hostel. Restaurants created by the company combine the best of world talent in gastronomy with fresh, locally sourced produce. A pioneer in urban and rural development, Adjara Group has shaped the face of the region as a result of the ecosystems which organically grow around each of the enterprises it creates. The company has the ability to turn even the most remote and underdeveloped regions across the country into attractive and sustainable destinations. Adjara Arch Group is the company’s in-house team of architects and interior designers responsible for all building and construction projects. The talented unit of twelve is known for developing unique buildings and turning historic and abandoned Brutalist structures into stylish, contemporary properties. The visionary professionals are creating high performance interiors with a juxtaposition of industrial minimalism and luxury avant-gardism. The experiences created at all of the Adjara Group properties are passionate and authentic; a mirror image of modern day Georgia interlaced with tradition and history. The unique combination of color, texture, artwork, furnishings, music and lighting result in a distinctive signature design ethos. Design Hotels™ represents and markets a curated selection of over 300 independent hotels in more than 60 countries across the globe. More than a collection of hotels, the company is a collection of stories. Each property reflects the ideas of a visionary hotelier, an "Original," someone with a passion for genuine hospitality, cultural authenticity, thought-provoking design and architecture. Each "Original" stands for the individual, aesthetic and service-driven experience that his or her hotel provides. In 2015, Design Hotels™ joined forces with Starwood Preferred Guest (SPG®), enabling its member hotels to have both a greater and more selective reach while offering its Community the benefit of the industry’s leading loyalty program. In every participating member hotels, SPG® members can earn and redeem Starpoints on every stay.